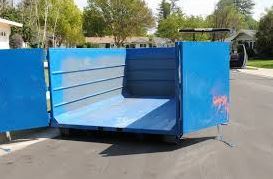 At Green Solutions we give you expert advice in choosing the dumpster that most suits your needs. Whether you are renovating a house, cleaning out a storage unit or garage, or need green waste removal, we have the right size roll off dumpster for you. Something to consider before ordering your dumpster is the access to your property. The size of your gate or driveway will determine the choice of dumpster. Most cities in the United States have laws prohibiting dumpsters or debris boxes from obstructing public right of way areas, pavements, streets, pathways and public green spaces. Instead of situating your dumpster in such a place, you will often have to make space for it on your own property, which can be difficult if the container is too large. Large containers may block driveways, preventing vehicle access. However, storing them elsewhere on one’s property can damage features of the landscape, such as turf and flora. Sometimes the small or medium size dumpsters are easier to place and remove off private properties once they are full. Unless you are doing a major house renovation, consider these more convenient sizes. It’s also important to discuss the collection times so that you know exactly how many days you will have the dumpster for. Our dumpsters are good for residential or commercial projects. Depending on availability, we can do same day deliveries in certain areas. We will deliver and collect the dumpster when you are done with it. Call us at Green Solutions to speak about your dumpster needs. We have various sizes to recommend to you.